Alvaro Morata scored twice as Chelsea beat Crystal Palace 3-1 to give Maurizio Sarri a record-equalling start to Premier League management. Morata's first-half strike was cancelled out by Andros Townsend as Chelsea struggled to subdue their vibrant visitors, for whom Wilfried Zaha starred. But Eden Hazard, back from a three-game absence with a back problem, provided the striker's second with his first touch, sending over a free-kick which Morata expertly diverted into the net. The often derided Spain frontman now has five goals in his past six Chelsea games and Pedro added a third soon afterwards as the Blues moved second in the table, above Liverpool on goal difference. Palace are now without a win in six league matches. 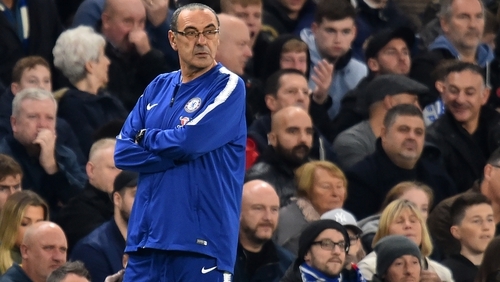 An eighth victory from an 11-game unbeaten start saw Sarri, a 59-year-old former banker, equal Frank Clark's Premier League record. Clark was undefeated in his first 11 Premier League matches with Nottingham Forest in 1994. Sarri, who replaced Antonio Conte as head coach in July, will be seeking to extend his own streak next Sunday against Everton, following Thursday's Europa League clash at BATE Borisov in Belarus. The Italian resisted the temptation to tinker with the line-up which secured a 4-0 win at Burnley, leaving Hazard on the substitutes' bench. Both teams were trying to show they were not over-reliant on one player, but neither managed it in the first half. Without Hazard on the pitch, Chelsea appeared to lack a cutting edge. Zaha, meanwhile, operated at another level to his team-mates and was often isolated. He constantly caused trouble for the Blues and created a shooting chance for Max Meyer, who fired over from the edge of the box. The German winger then had a shot blocked by David Luiz, who next delayed Zaha long enough for the forward to pass into space, his team-mates failing to keep up. Chelsea scored with their first shot on target. Pedro's cross towards Morata was returned to him by James Tomkins. Pedro centred again, Morata controlled, turned and fired in with his second touch. Willian had an effort correctly ruled out for offside three minutes later and Hazard was sent out to warm up early in the second half. His introduction for the first time since the draw with Manchester United appeared more likely when Palace levelled after Luiz had been caught cold. James McArthur fed Townsend, who surged by the Brazil defender and held him off before finishing superbly for his first goal in 20 league games. Morata had a header saved by Wayne Hennessey, but was offside anyway. The Palace goalkeeper saved a Luiz header from Willian's free-kick as the visitors' set-piece vulnerability was exposed again. Hazard and Mateo Kovacic were sent on for Willian and Ross Barkley and Hazard had an immediate impact. The Belgium playmaker's free-kick bounced through to Morata at the far post. The striker controlled the ball and drilled a shot into the far corner. Chelsea had a third soon afterwards when Marcos Alonso's low cross from the left evaded four Palace defenders and Pedro finished with aplomb. Morata missed a hat-trick opportunity when played through by Hazard on the counter-attack in stoppage time. His attempted lob of Hennessey was poorly executed and held by the goalkeeper.